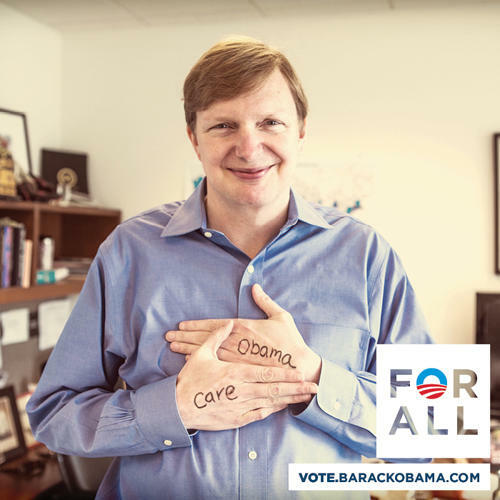 Jim Messina wants to thank me for the hard work I have done for the Obama campaign. President Obama made a surprise visit to the campaign office in Chicago yesterday to give a heartfelt thank-you to staff and volunteers. I wanted to pass this video along, because it’s a message every single person who helped build this campaign deserves to see. He wasn’t just talking to those of us in the office — he was talking to all of you. So many times in this election, this campaign was counted out. They said our supporters wouldn’t turn out, and we’d never see the kind of voter participation we saw in 2008. They said we’d be buried in money and special-interest influence. And they said that no campaign could overcome the political headwinds we faced. How we got here must guide where we go. If we’re going to accomplish the things America voted for on Tuesday, you’ve got to be even more involved in getting them done than you were in giving us all the chance. For now, I just want to say I am so proud of this team. And I can’t wait to see where you take this incredible movement from here. You’re welcome Jim. Now, go back to that playground you were lurking in. I actually have no idea who this actress is, but she has managed to commit the one unforgivable act in Hollywood. She has expressed her support for Romney. To make matters worse, she is black. Actress Stacey Dash, who has starred in everything from the 90′s hit Clueless to CSI, prompted a firestorm on Twitter after publicly endorsing Republican nominee Mitt Romney, and then standing by her opinion. “Vote for Romney. The only choice for your future. @mittromney @teamromney #mittromney #VOTE #voteromney,” Dash wrote on her official Twitter page, accompanied by a photo of herself with an American flag. Of course, the Liberals responded in their usual classy and respectful way. As news of Dash’s treatment spread, however, First Amendment-lovers nationwide began voicing their support for the actress using the hashtag #ISupportStaceyDash. And here are some of the best/worst responses, courtesy of Twitchy. Of course, it is the Conservatives who are the hateful racists. She has stood firm by her opinion and has had much support from those who actually believe in that archaic concept called freedom of speech. Maybe I should go and watch something she has acted in. Nero Claudius Caesar Augustus Germanicus, more familiarly known as Nero was one of the most notorious of the Roman Emperors. 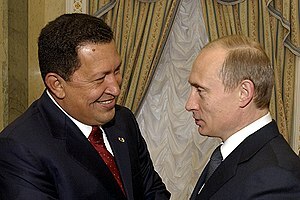 Many historians have depicted him as a monster of vice and cruelty. He really wasn’t all that bad, though. He reign was actually mostly successful until the end. Still, I wouldn’t call him exactly good either. He did murder his own mother and he was the first of the emperors to persecute the Christians. One of the most prominent and long-lasting stories about Nero is that when the City of Rome nearly burned completely down in 64 A.D., Nero did nothing to try to help anyone and instead played his fiddle while singing of the fall of Troy. That story is almost certainly fictional. For one thing the violin had not been invented yet, so Nero would have played a lyre. Actually, Nero was out of town when the fire broke out, but rushed back to Rome as soon as he received the news. There wasn’t much anyone could do to fight the fire in those days, but Nero did open up his palace gardens to house the Romans made homeless by the fire. Unfortunately, after the fire finally burned out, Nero decided to rebuild Rome, replacing the old, narrow streets and crowded tenements with a rationally designed new Rome, which included a huge new palace for himself. This started the rumor that Nero had started the fire himself and led to his blaming the Christians and persecuting them. Whatever the truth of the story, however, the phrase fiddling while Rome burns has become a byword for someone who takes no action or is distracted by trivialities when things are falling apart all around them. Which, brings us to our modern Nero. The entire Middle East is burning and Barack Obama doesn’t seem to be taking matters at all seriously. Well, he does take fund raising for his reelection campaign seriously. WASHINGTON — President Barack Obama’s re-election campaign is getting a boost from pop stars Beyonce and Jay-Z. Yet, he can’t take time off from his busy schedule to attend daily intelligence briefings, heed warnings that our embassies might come under attack, meet with the Israeli Prime Minister over Iran’s continuing progress in making itself a nuclear power, or even take our looming fiscal catastrophe seriously. 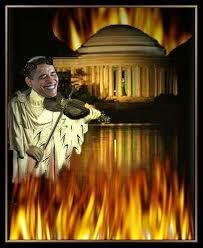 He might as well be fiddling. With the economy going downhill and an increasingly dangerous world we live in, it is nice to know that the media is willing to ask President Obama the tough, hard-hitting questions. Looking over the headlines in the Drudge Report, I am beginning to wonder if everyone in the world is starting to lose their minds. First, there seems to be an outbreak of cannibalism. There is the face-eating bath salts user in Florida, a cannibal in Maryland who ranted on Facebook, and a creepy Canadian cannibal running around France dressed as a woman. President Obama thinks he will be able to get more things done after the election when the “Republican fever” breaks. In other words, if he is reelected he will still try to pursue his unpopular agenda and squander the taxpayers’ money on crony capitalism. I have a feeling the Republican fever won’t be breaking. Here, in the Washington Post, are the last minutes of a snake-handling preacher’s life. I wonder if he has been nominated for a Darwin Award yet. Mayor Bloomberg calls critics of his proposed bad on large sized soft drinks “ridiculous”. I can think of worse things to say about a politician who thinks he ought to micromanage people’s lives. What’s next? Cameras in people’s homes to make sure they exercise?, sensors in toilets to examine people’s excrement to ensure they are eating a healthy diet? These scenarios seem outlandish, but I wouldn’t put anything past the health Nazis. And DC Comics has decided to make the Green Lantern a homosexual. Why? Comic book superheroes don’t need to have any kind of sexuality at all. Who are these perverts who have to include a gay character in every conceivable form of entertainment? Can’t we have a break from this? And that is the way it was.